Let Jingle juice spread Christmas cheer this holiday season! This fun, brightly colored holiday drink is full of spiced rum and citrus flavor making it a fantastic Christmas party drink! Jingle Juice, Jingle Juice, Jingle all the way! Heading into Day 5 of 25 drinks of Christmas, with this deliciously fruity drink. This brightly colored holiday cocktail will brighten up anyone’s day! It’s so light and refreshing with all the fresh fruit and citrus flavors mixed with a bit of spiced rum for a great cocktail party drink to sip on with friends and family. Aside from the White Chocolate Peppermint Martini, this one ranked pretty high on the list of bringing Christmas cheer! If you’re looking for a holiday drink that is light and refreshing as opposed to smooth and creamy, this recipe would be it. I love all the fruit flavors meddling together with the sparkling water and the spiced rum flavor. The sugared cranberries add a nice touch of color as well and aren’t to shabby to eat either! If you want to keep it easy, you can just use Sprite in place of the sparkling water and the lemon and lime juice. I just prefer the freshness of adding real fruit. It also cuts down on the sugar. Both will give you great resutls. A light fruity cocktail that is perfect for holiday parties! 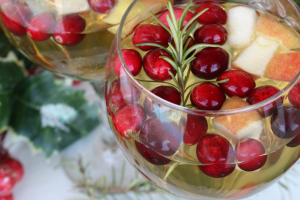 Garnish with citrus fruits and cranberries to spread bright colors and Christmas cheer! In a medium saucepan, combine 3/4 cup of sugar with water. Stir until sugar is fully dissolved. Pour simple syrup into a heatproof bowl and allow to cool for 10 minutes. Add in cranberries and stir to coat. Allow cranberries to sit overnight. Remove cranberries from syrup. Set aside. In a pitcher filled with ice, pour in spiced rum, amaretto, and triple sec. Then add juice of lime, and lemon. Add in orange juice, pineapple juice and apple cider. Last add sparkling water. Stir until combined. I like to keep everything cold. Leave in fridge if serving later. Add garnishes and stir thoroughly before serving. 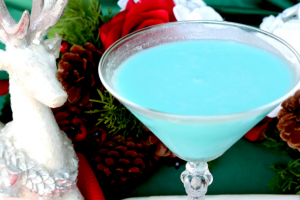 If you are just tuning in for 25 drinks of Christmas, don’t forget to check out all the other Christmas party drinks like vanilla cranberry mimosas or white chocolate peppermint martini! This is Day 4 of holiday cocktails so you have plenty left to enjoy! I just bought a bottle of amaretto – well, looks like I am all set to make this now. So festive! Cheers! 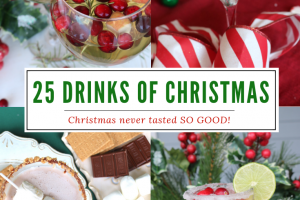 If I didn’t have to get up every morning to go to work (as a full time HS teacher) I’d taste test you 25 drinks of Christmas everyday with you.. 😀 this looks yummy! Sounds yummy! will have to try this. These are perfect when you have guests coming over!